Lawyers, pedants and fanboys may hold that Microsoft wasn’t lying when it named its Universal Mobile Keyboard. But Windows Phone users may come away unconvinced. From a hardware standpoint, Microsoft’s $80 Universal Mobile Keyboard continues its tradition of excellence, with a well-thought-out design incorporating a hardware switch to reconfigure the keyboard for Android, iOS, and “Windows” devices. Look closer, though, and what Microsoft bills as a “universal” keyboard simply doesn’t deliver, because it doesn’t support Windows Phone. It’s yet another frustration for Windows Phone users, who have become accustomed to playing second fiddle, even within Microsoft itself. It’s a practice that Microsoft’s Ifi Majid, head of experiences marketing for Microsoft’s Devices Group, promised would end—but Microsoft’s design teams apparently didn’t get the memo. Closed, the keyboard looks something like a Lenovo ThinkPad—just a rectangular oblong of black plastic. But when opened, the keyboard reveals itself, and powers on automatically. Charge it overnight, Microsoft says, and it’s good for six months. If you hold the power button on for several seconds, it pairs with discoverable Bluetooth devices that support the Bluetooth HID standard. 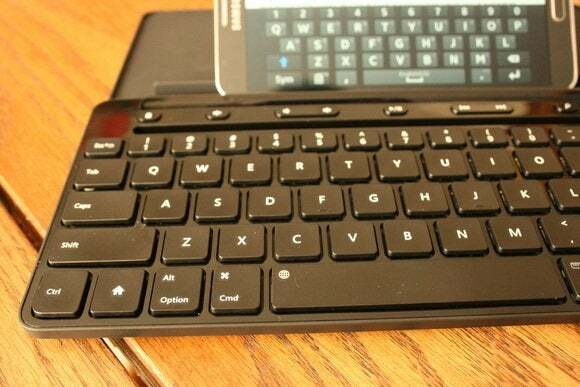 A switch reconfigures the Microsoft Universal Mobile keyboard for Mac/iOS, Android, and Windows devices. 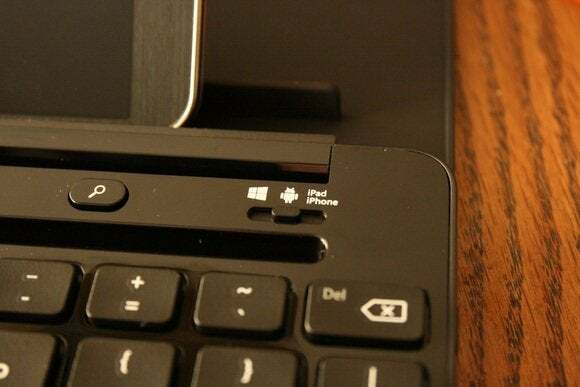 The upper part of the case “holds” a phone or tablet with one of two plastic ridges that grab it, like holding on to a ledge with your fingernails. But despite that metaphor, the construction is quite sturdy. Initially, the ridges didn't hold the mobile device at an angle I found convenient. Surprise! 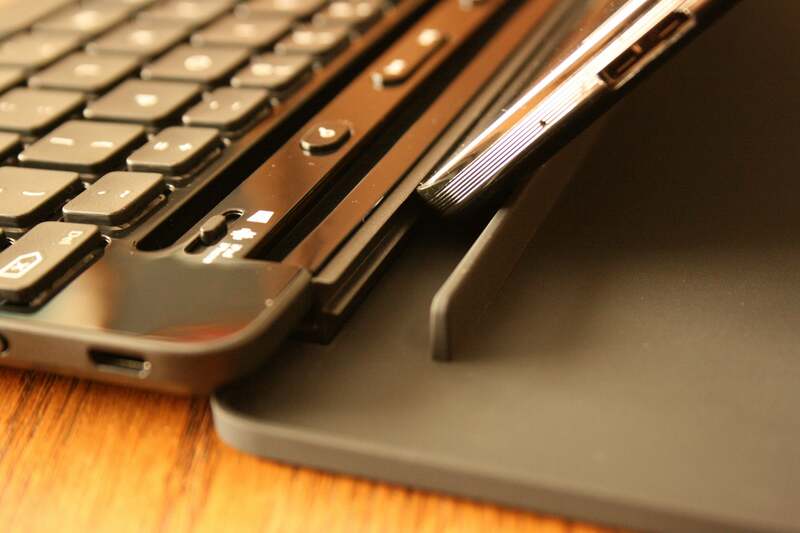 The keyboard's top half detaches, allowing you to find a comfortable angle to work. The most important consideration is how thin the device is: I would expect all modern smartphones to fit, but the the ridges wouldn’t grab a thick Microsoft Surface Pro 2 tablet. A pair of ridges hold the phone, although not totally securely. On iOS, both the ESC and CMD keys on Microsoft’s keyboard take you to the home screen of your iPhone and iPad. Pressing a dedicated function (Fn) key plus the ALT key can open or close your virtual keyboard on your iPad. If an Android phone or tablet is connected, tapping a dedicated “Home” key brings you back to the home screen. Hitting ESC equates to the Android back button. And tapping CMD is equivalent to the CTRL key on Android—which I would have assumed to be the menu option, showing a list of recently opened programs on my Galaxy Note 3. But it doesn’t seem to have a specific function on that particular phone. It all sounds rather confusing, but in reality there’s only a few key combinations that shift from OS to OS. Most people already instinctively know to type ESC to back out of an operation. I kept the keyboard cheat sheet near me for a few minutes, but found I could discard it after then. But there’s one major problem: Microsoft’s Universal Mobile Keyboard doesn’t seem to pair with Windows Phone. 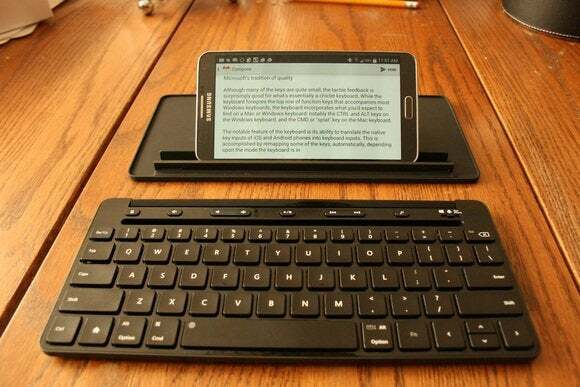 Yes, it pairs with Windows; if you have a Windows tablet without a keyboard, you can use the universal keyboard instead. But if you want to connect to Windows Phone, it doesn’t pair. I tried it with two: a Nokia Lumia Icon (Windows Phone 8.1) and the latest Lumia 830 (Windows Phone 8.1 Update) just to check, but—nope. Why, Microsoft, why?! Microsoft takes keys from several different keyboard layouts. So how does it type? Pretty well, but with a few hiccups. In general, I found I could type at about 80 to 90 percent of the speed I can reach on a Surface Pro 3—which isn’t all that fast, about 50 words per minute or so. 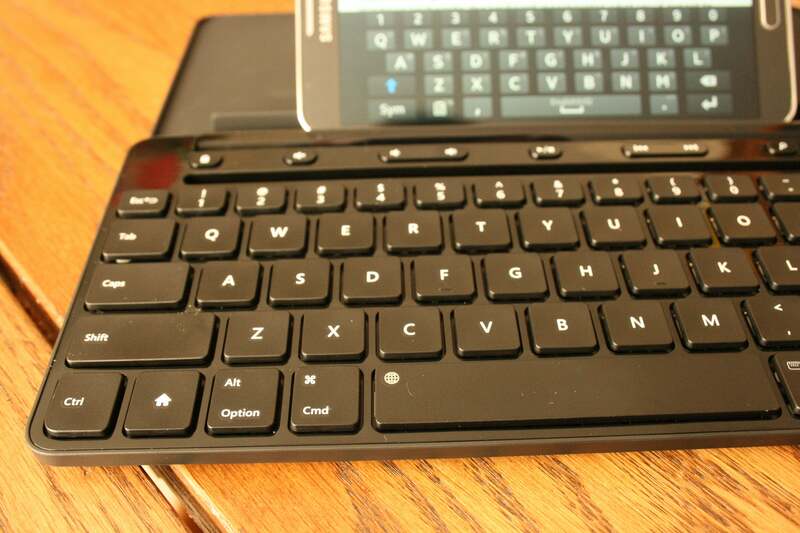 (Unlike the SP3, the Universal Mobile Keyboard lacks a touchpad or pointing device.) The smaller keys didn’t lead to many additional errors, although my fingers sometimes drifted down to the bottom row of command keys. Fortunately, that didn’t produce any negative results, although I did find myself tapping the Fn+SPACE keyboard combo by accident, which briefly displays the keyboard language on the screen. Personally, I find I type fairly quickly over short periods on a smartphone keyboard. But that isn’t the target customer for Microsoft’s Universal Keyboard—it’s the executive who totes around a bunch of different devices in a backpack or briefcase, and has to do some real work in a pinch for a half hour or so. Just not on a Windows Phone.